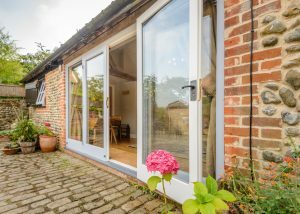 Mimi Cottage is situated on the outskirts of the seaside village of Sea Palling, with Fenside next door! It is a very short walk to the Blue Flag beach and is ideally situated for soaking up the stunning countryside views that the cottage has unfettered access to. Like Fenside, it really has the best of both worlds. In Sea Palling you will find a dog friendly pub, dog friendly cafe (which does pretty amazing hot chocolate and fresh donuts), a really lovely fish and chip shop and a local shop all just a few minutes walk away. It is a short drive to Horsey, then Winterton on Sea (which also has a fabulous beach) but you can walk to both from Sea Palling, perhaps taking in a visit to The Nelsons Head or The Fishermans Arms. (Both pubs do very nice food and are both very dog friendly). Hickling is a 5 minute drive away, or you can walk there via the bridle paths. There are two very nice dog friendly pubs to visit (The Greyhound and The Pleasureboat Inn), Hickling Broad, and the village also boasts a local riding stable. Stalham town has some shops, such as Truly Local (and on the way there you will pass our lovely local farm shop and Causeway Butchers). When you arrive at Mimi Cottage, park your car in the very spacious driveway. There is enough parking for up to 6 cars. Note that the driveway is open with no fencing around it so please do be aware of this when you remove your dogs from the car. It is spacious and airy with two single beds that can be joined into a superking. There is a further single bed which makes it a fabulous children or family room. There are side units, lamps and wardrobe storage. This newly renovated shower room has been furnished in a contemporary style with a white suite. A lovely walk in shower, sink and toilet. This room also contains a washing machine and dryer. This modern and very well equipped kitchen has everything you need (and more). There is a good selection of cooking utensils, crockery and cutlery etc, large fridge freezer, six burner gas stove, dishwasher and lots of storage space. with stunning views over the fields towards Horsey. There is ample seating for up to 11 people at the large dining table. There are patio doors to the lovely garden. This airy and spacious sitting room is large enough to seat your whole party and has double aspect views to the fields. There are two large sofas, coffee table, lovely lamps, a stunning woodburner and a very large TV showing all terrestrial channels and BT sport. Netflix and Amazon Prime are available if you remember to bring your login details. Come back into the hallway and turn left to go upstairs. This large room has a superking bed which can be split into twins if needed. There are bedside units, lamps and wardrobe storage. Views to the side of the cottage. This large room has a generous double bed There are bedside units, lamps and wardrobe storage. Views to the side of the cottage. This large room also has a generous double bed There are bedside units, lamps and wardrobe storage. Views to the side of the cottage and fields. A modern bathroom comprising matching bath, sink and toilet, with heated towel rails, wall mirror and window to the garden. This very large room has a superking bed which can be split into twins if needed. There are bedside units, lamps and storage. Views to the cottage garden and towards Horsey. This very large garden is fenced to a height of 3 to 3.5 feet high. The owners do not wish to impede the stunning views across the fields, and what a view it is! The garden is laid mainly to lawn with some shrubs. There is also a swing and slides plus a little Wendy House. There is also a smashing covered dog kennel in the right corner of the garden. A really wonderful enclosed space for your dogs to have some fab zoomies. There is a large L-shaped patio with picnic table to seat up to 12. The owners have also supplied a barbecue. (Please supply your own fuel). That Mimi Cottage is a non smoking cottage and we would be grateful if you could respect this. All major supermarkets deliver and groceries can be put away for you before you arrive if you want to arrange an online delivery. Just let us know. From the A149 Stalham bypass take the turning signposted Happisburgh/Walcott/Bacton at the western end of the town (Stepping Stone Lane B1159). At the end of the lane, turn right at the junction and stay on the road into Stalham for approximately 0.5 mile until you reach the first junction in the town with the High School on your left hand side. Turn left at this junction and follow the road through Stalham, to Ingham. Follow the road through Ingham (past the now being revamped Ingham Swan, and follow the road to the first junction which is signposted Sea Palling. Turn right at this junction towards Sea Palling, passing Causway Farm butcher and the farm shop. Just as you enter the village, the road bends to the left and Church Road is on the RIGHT. Drive down Church Road, and after approx. 200 metres, the road splits; take the right hand fork and you will see Fenside’s gate immediately in front of you after approx. 100 metres. Follow the driveway around the front of Fenside, and you will see Mimi in front of you. Waiting on our first lovely guests. Hi! My name is Gail Adams and a huge welcome to Pack Holidays. Pack Holidays started off with just one cottage - my own. I wanted to run a holiday let which catered for multi dog owners. I am a multi dog owner....they are my family and of course, family comes first! I also had trouble finding cottages that would take us when we wanted to go on holiday so what better than providing that kind of service to our lovely dog owners who want to come on holiday to Norfolk. Pack Holidays is a member of the English Association of Self Catering Operators.